Benjamin Franklin Alford, Jr. 76, Indianapolis, passed away Friday, October 10, 2003. He was born on December 6, 1926 in Chattanooga, TN and was a graduate of the University of Tennessee. Mr. Alford was a self-employed Utility Consultant. Previously he was employed by Tenneco and then Ernst & Young as a Utility Consultant. He was president of the board of trustees for West Lawn United Methodist Church, Westlawn, PA and the President of the Alford [American] Family Association. A memorial service will be conducted at 11 a.m. Monday, Oct. 13 in Westminster Village North Chapel. Survivors: wife of 37 years, Ruth E. Kemp Alford; son, Benjamin F. (Sarah) Alford, III; step-daughters, Dolly C. (Stephen) Sumrow and Kay C. (John) Quatroche; grandchildren, Lee Sheppeard Alford, Jennifer S.A. Ackerman, Rachel L. Kettelle, Erin M. Kettelle, S. Andrew Sumrow, Matthew Sumrow, Christina Sumrow, Gloria Sumrow and Lauren Quatroche. He was preceded in death by a brother William F. Alford; and daughter Carolyn Denise Ketelle. Arrangements entrusted to Flanner & Buchanan Funeral Center—Oaklawn Memorial Gardens. AAFA NOTES: SSDI records confirm the birth and death dates Benjamin F. Alford Jr. (SS# issued in TN), last residence Indianapolis, Marion Co., IN. Ben was the son of Benjamin Franklin Alford and Edith Lillian Pickel Alford. Although not entirely surprised, we were saddened to learn recently of the death of a friend and faithful member of the Association. 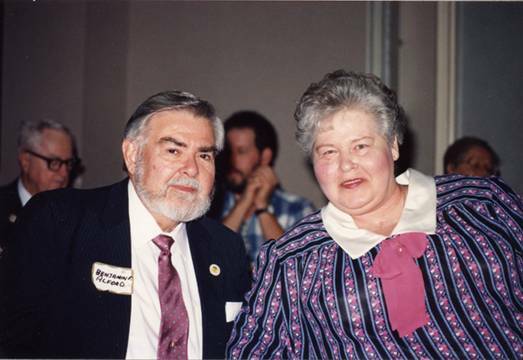 I came to know Ben when he and Ruth appeared at our 1991 meeting in Jackson, MS. Over the years he attended nine AAFA meetings and would have made it to more had it not been for the health of his wife, Ruth, or for reasons of his health. Most recently they both were in a nursing home in Indianapolis, IN, because of their condition and to be nearer their kin. After considerable discussion with Ben at the meeting in Jackson, and with an exchange of correspondence, he consented to take on the job of AAFA State Representative for Pennsylvania. That was in the days when we were trying to make that concept work. He was announced as such with the photograph of him and Ruth in the meeting report published in AAFA ACTION, December 1991, page 22. He took his assignment seriously, began searching for Alford data, and submitted the report “On Assignment in Chester County, PA,” AAFA ACTION, September 1992, page 56. As you may remember, the late Hal Alford was elected president at the 1991 meeting in Jackson, MS, but had to resign for reasons of health before the year was over. As we approached the 1992 meeting in Destin, FL the office of president was vacant and VP Ray Alford was our leader. He would not accept the position of president. Ben was asked if he would consent to serve as president or vice-president if nominated and elected. The following is an extract from Ben’s letter of Sep. 17, 1992. We were unable to find any other candidates, and Ben was elected president at the 1992 meeting in Decatur. He served through some of the most difficult days of AAFA and he continued as such until I replaced him as president in the election at the 1996 meeting in Springfield, MO. He served on the board of directors for most of that same period. I have a 3-ring binder filled with letters from Ben that demonstrate his interest in, and concern for, AAFA and its purposes. He served as the leader of the members who descend from John Alford who was born about 1786, probably in North Carolina. As recently as this year, 2003, in Little Rock one of the descendants appeared at the meeting hoping to meet with Ben. Ben was a good fellow, a big man, and in some ways a strange person. Many of us marveled at his dedication to wife Ruth who was confined to a wheelchair for most of the time we knew them. Her condition was caused by a error during surgery that rendered her unconscious for too long. There were very few places that Ben went that he could would carry Ruth, wheelchair and all. One exception was my basement and the AAFA data collection. They came by here one year after the meeting, when he was still president. Knowing what was involved he left Ruth at the motel with the TV and her creature comforts. After the meeting in Decatur, AL in 1995 Mary and I toured the Space Center in Huntsville with them. Up and down, in and out, and round and about he pushed that wheelchair everywhere. When Ruth needed the services of the powder room Ben did not hesitate to roll her right in and go with her. He did not impose on other females in the party to assist. I heard more than one person say that Ruth would out live him—and she did. While Ruth’s ailment was obvious— one would not suspect that Ben had a heart problem and later cancer. In spite of Ruth’s condition they took things in great style. They liked to tell about the time when she fell down in the ladies room at the airport in Puerto Rico when she was still slightly mobile. Of course when she did and Ben discovered it he rushed right in to help her and great confusion followed with the language situation. On one occasion Mary and I were riding with them and that in itself is an experience. He drove the big old Cadillac, which was overloaded with the motorized wheelchair and hoist in the trunk, like he was in the Indy 500 with Ruth yelling at him most of the time. We came to a grade railroad crossing one time when a train was crossing the road. There were two tracks, the one nearest us being a side track which had to be accessed from the main line, and it was obvious to Ben that no trains would be coming down it while the other train was passing. Of course Ruth did not know that and could imagine another train plowing into the side of the car while it was sitting there waiting on the track. She screamed at him and pounded him, while he completely ignored her, until the train cleared and we moved on. Ben was considered “strange” by some of us because he had a computer all hooked up with software installed, but he would not use it—for email or otherwise. All of his communications were handwritten. We used to talk on the phone and he would describe the computer sitting there beside him. I’m going to miss my friend Ben. For more information on Benjamin’s family, see AAFA’s published genealogy Known Descendants of John Alford and Jane McElhattan. His lineage: Benjamin Franklin 1926 TN1, Benjamin Franklin 1887 TN2, Charles F. 1865 TN3, Robert Cannon 1816 TN4, John 1786 NC/TN5.